Donald Harlow was born on September 22, 1920, in Waterville, Maine. He enlisted in the U.S. Army Air Forces on August 22, 1942, and completed basic training at Atlantic City, New Jersey, in October 1942. Pvt Harlow next attended the Armament School at Buckley Field, Colorado, from October 1942 to January 1943, followed by service as an instructor in the Aircraft Armament Ground School at Eagle Pass, Texas, from June 1943 to September 1944. Sgt Harlow served as an instructor in the Aircraft Armament Ground School at Matagorda Island, Texas, from September 1944 to September 1945, and then as NCOIC of Personnel Processing at Foster Field, Texas, from September 1945 until he left active duty on February 24, 1946. He then attended the California College of Commerce in Long Beach, California, before returning to active duty in the U.S. Air Force on August 23, 1950. His next assignment was as Personnel Chief Clerk with the 5th and 9th Maintenance Squadrons at Travis AFB, California, from August 1950 to July 1951, followed by service as Personnel Sergeant Major with the 5th Air Division at Rabat, Morocco, from July 1951 to July 1954. He served as Personnel Sergeant Major with the Air Force ROTC detachment at Southern Methodist University in Dallas, Texas, from July 1954 to May 1955, and then as Detachment Sergeant Major with the 3635th Survival Training Wing at Stead AFB, Nevada, from May 1955 to August 1958. MSgt Harlow served with the Directorate of Personnel for the 317th Combat Support Group at Pease AFB, New Hampshire, from August 1958 to April 1963, and then as Personnel Sergeant Major with the Air Force Element at Headquarters U.S. European Command at Camp des Loges, France, from April 1963 to July 1965. His next assignment was as Sergeant Major of the Executive Services Division in the Office of the Vice Chief of Staff of the Air Force in the Pentagon from July 1965 to July 1969. 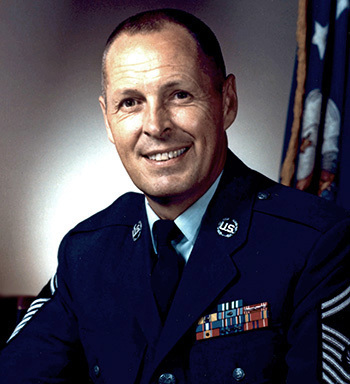 CMSAF Harlow served as the 2nd Chief Master Sergeant of the Air Force from August 1, 1969, until his retirement from the Air Force on October 1, 1971. 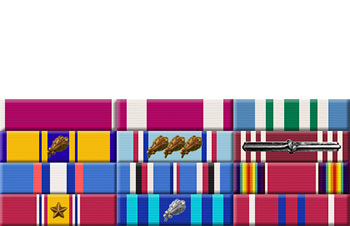 After retiring from the Air Force, Chief Harlow served as the Deputy for Legislation with the Air Force Sergeants Association from 1971 to 1981, and he became the only enlisted person in history to be inducted into the Military Order of the Sword by the enlisted personnel of Tactical Air Command on May 20, 1980. He died on June 18, 1997, and was buried at Arlington National Cemetery.